Photograph courtesy of Ines Mair. Taken yesterday in Pfaffenhofen, Tirol, Austria. 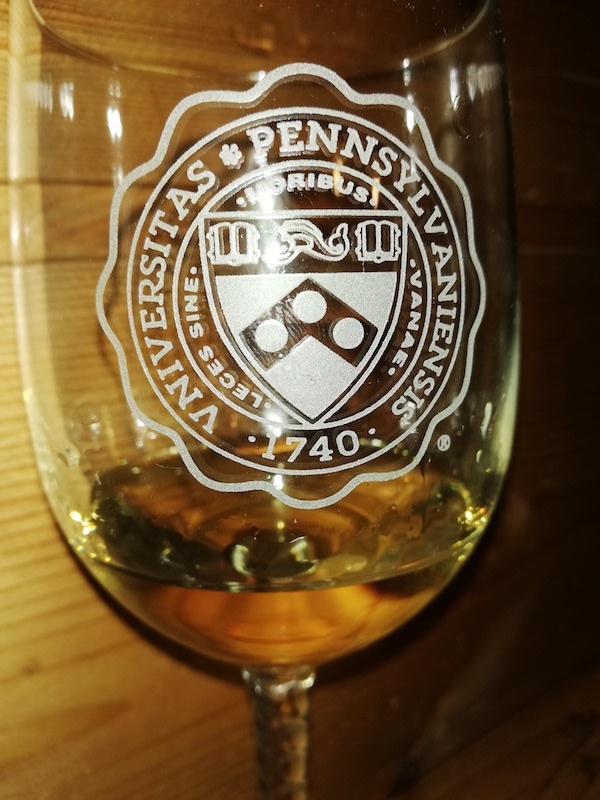 The glass was purchased in Philadelphia by her husband Gerald Mair when he was a visiting student at the University of Pennsylvania Law School decades ago. I rather like what we have ended up with. At least some early Latin texts have leces = leges (e. g., Eph. Ep. 19). Does Latin allow omitting the verb like that? In the same way that "sine moribus vanae" means "evil women without morals" (I don't see a sense for "loose women" among those listed here), "leges sine moribus vanae" looks more like "useless laws without morals". But I'm out of practice. It's not surprising for early texts to have LECES instead of LEGES, since the letter G is a later innovation. Compare the abbreviation for the name Gaius, which is C.
In fact, on further inspection, "leges sine moribus vanae" is a complete noun phrase in Horace's original rhetorical question, and it means "useless laws without morals". It seems like the worst possible choice for an extract from the quote. Michael: it is perfectly cromulent Latin to leave out the copula. Akkadian, which I read more often lately, does just fine without a verb =to be= at all! The phrase is properly read as "leges sine moribus vanae [sunt]", that is, "vanae" is part of the predicate with the copula "sunt", "[they] are", omitted. So, the whole locution is actually a sentence, subject + predicate, not simply a noun phrase. It's not obvious to me where to attach the prepositional phrase, as part of an NP headed by "leges", or to the predicate. Noel Hunt — As I said, I'm out of practice, but omitting the verb isn't something I expect from Latin. Can you cite some examples of sentences that don't bother with it? In the original line (where the verb is not sunt), it's very clear that vanae is just an adjective modifying leges. If you wanted to form a coherent sentence based on Horace, but phrased as a statement instead of a rhetorical question, I would have expected nihil leges sine moribus vanae proficiunt or some such. Omission of the copula is quite common, especially in poetry. If you look up 'Zero copula' in google you will find a wealth of information. Zero copula is a feature of many languages. An example in Latin would be 'in vino veritas [est]'. The phrase in question, as it occurs in the motto, would be interpreted as I suggested. The original line from Horace has to be parsed differently. This is a terrible example of Latin permitting copula omission, as it clearly features est and the verb isn't even a copula, but is rather attributa est. Correction: "truth has been attributed to wine". If "VNIVERSITAS" uses a "V" for "U" (classical Latin orthography), perhaps "MORIBUS" should be "MORIBVS". Oh, I thought you meant "Pennsylvaniae". That's what sounds natural to me. I am born in a region which a) has a similar name, and b) has a latin native language. (Transylvania). *V*niversitas Pennsylvani*ensis* sounds to me like "Volkenswägenverein" for a VW-Fan-Club, which might be technically… not wrong; but it is a sure case of Heavy-Metal-Umlaut, and of "let's make it more Rammstein!". And "Lece" for "lege" looks today like a typo, and maybe it always was (based on the similar shape of C and G), like the many, many misunderstandings today, based on limited alphabets and lazy transliterations. Did you know the latin Wikipedia is named "Vicipaedia" with a "c" like in "vicious", right now? …and Pulišić is pronounced like "Pulisik" in the USA, today, in the age of the Internet? …so I would pardon some poor, hard-working stone-cutter 2000 years ago, for writing Cartaciniensis on somebody's columna rostrata – instead of Cartaginiensis, or Karthaginensis or whatever better alternative might have been available at that time. Oh, here is the "-iensis" again! So, hmm, fancy-pants "latinizing neologisms" have a long tradition, it seems. Latin “tags” used proverbially sometimes come without copula (in vino veritas being a good, or bad, example as noted). Sometimes the copula is omitted in the original, especially in poetry, as with “facilis descensus Averno” (Vergil, Aeneid 6.126): the descent to Hell [is] easy. @Michael Watts: Mottos are a good place to find (?) the missing copula. Astra castra/numen lumen comes to mind. Or Dictum meum pactum. An obvious misprint. Indeed, the entire glass is misprinted. It should have the Yale seal, Universitatis Yalensis, and Lux et Veritas. There… that looks much better. Proverbs and mottos (in any language) frequently omit verbs: ‘e pluribus unum’, ‘per ardua ad astra’, ‘better X than Y’. 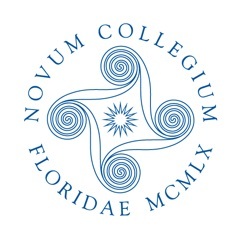 Your Penn story reminded me of a similar one from my own school, New College of Florida. Some fifty years after its founding, I saw this note in a newsletter. 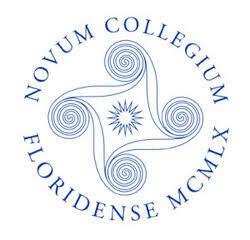 > Regarding the implementation of the new NCF crest, Beneš expected an “incremental rollout,” and noted that the discovery of the creation of the crest’s text was the straw that broke the camel’s back in regards to Rohrbacher involving himself in fixing it. Pei was engaged back in the early 1960s to design the new campus. In the end, he only did dorms and a student center … and the seal. The dorms leaked; the seal was ungrammatical. The fact that 'in vino veritas' can be traced back to the writings of Pliny the Elder (as cited) is not relevant to its use as a motto, as is (often?) seen on bottles of wine. In that case it can only be interpreted as I pointed out. In this case, as is the case with the Pennsylvania University motto, there is an original source sentence where the phrases in question would be construed differently, but without all that extra context, as they appear as mottos, the natural construal is as zero copula constructions. No mistake. The spelling "leces" dates from the archaic period when the Romans had not yet invented the letter G; it has no further significance. I give the mononymous Chris' comment 1 upvote. It is as obscure as any other of the most excellent posts above, but has the added feature of eliciting multiple guffaws. As well the added feature of contemporary reference to the linguistic apparatus of the Internet. Now for me, c preceding the invention of g makes plenty of sense, as one could easily contemplate the similarity of sound between the leading consonants of cat and gato. Go ahead say them… I just did, it feels nice. I am missing something here in my post… ah, I know now and remind myself to close out the post by cheerfully addressing the actual topic of the motto of U of Pa. Whether in Latin or whether understood in another language I believe it's the meaning of Penn's motto that is it's fantastic wonder. Truly, law is an artifice and morals are the good thing. A society divests morals from its laws at its own great peril! @Cuconnacht: The most common form seems to be "De gustibus non est disputandum" [link]. With all due respect to Prof. Ringe, I think leces is a mistake. Why would anyone choose a little-known archaic spelling instead of the standard Classical form, especially when the quote is from Horace? I'm reminded of the notorious hanc pontem inscription at Berkeley (“Merrill defended the gender as written, having found feminine pons in some late ancient or early medieval writings"). Chris : "the latin Wikipedia is named "Vicipaedia" with a "c" like in "vicious"". Not clear how serious you are being. Revised (or restored) pronunciation of Latin was used in schools in England over 60 years ago, and in "1066 and all That" published in 1930 one of the jokes depends on restored pronunciation: (veni, vidi, vici = weeny, weedy, weaky). So "Vicipaedia" would be pronounced pretty much like Wikipedia in Englsh.